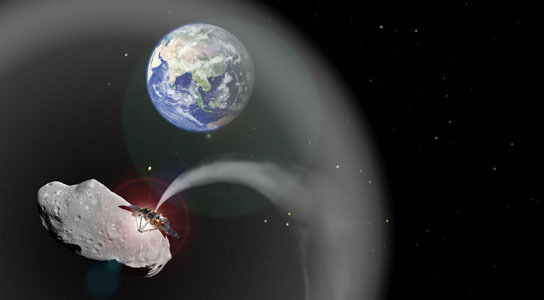 Scientists propose a dust cloud made of asteroid material could help to cool Earth. 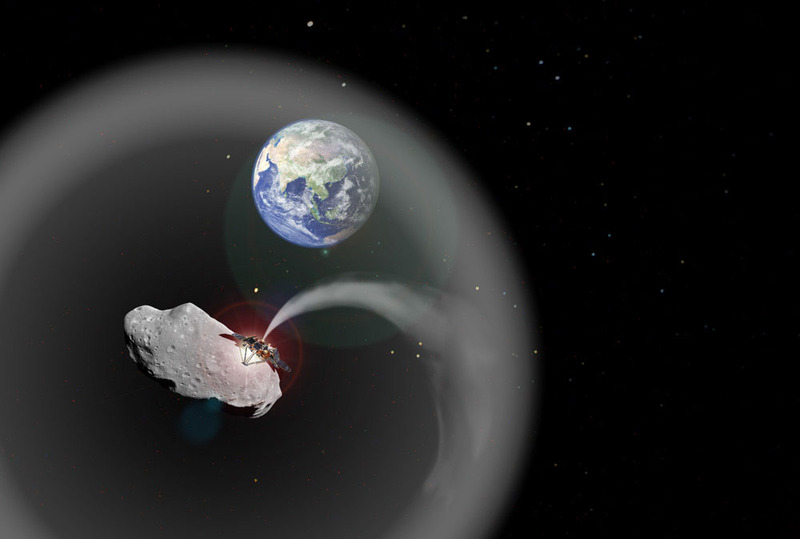 Here, an artist’s depiction of what a spacecraft spewing asteroid dust might look like. CREDIT: Charlotte Lücking, based on images from ESA and NASA. Scottish scientists have proposed to use a giant space-based dust cloud, blasted off an asteroid, to shade the Earth from the sun. Deliberately manipulating the Earth’s climate with large-scale engineering projects is called geoengineering and these proposals are always controversial because of the risk that they entail. The scientists will publish their findings in the journal Advances for Space Research on November 12. Instead of altering the climate by targeting the oceans or the atmosphere, these types of geoengineering projects would affect the entire Earth from space. A cloud of dust could be obtained by gravitationally anchoring an asteroid to block sunlight and cool the Earth. The dust cloud wouldn’t be a permanent solution, but it could offset the effects of climate change for some time and allow slower-acting measures like carbon capture to take effect. The asteroid would be placed at Lagrange point L1, where the gravitational pull of the Sun and Earth are canceled out. L1 is 1.5 million kilometers away from Earth. The asteroid could be fitted with a “mass driver”, which could hurl asteroid-derived matter away from the rock. It could also serve as a rocket to push the asteroid to the L1 point. 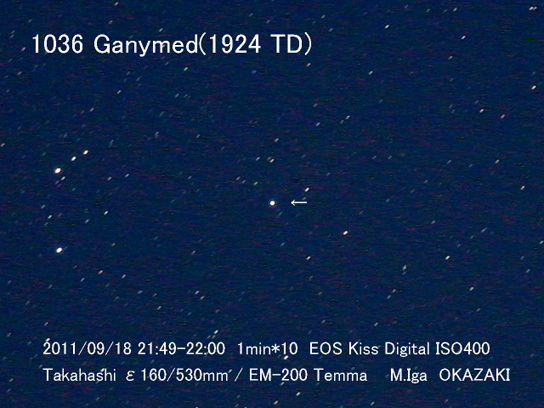 The nearest large near-Earth asteroid is 1036 Ganymed, and this asteroid could maintain a dust cloud large enough to block out 6.58% of solar radiation that would normally reach Earth. This would be more than enough to combat any current global warming trends. The cloud would be about 5 quadrillion kilograms in mass and about 2,600 km in width. Ganymed has a mass of 130 quadrillion kilograms. The challenging part of this proposal would be how to push an asteroid of this size into L1. However, smaller asteroids could be moved and clustered together at L1 instead. Like many geoengineering schemes, there’s no way of fully testing this dust cloud’s effectiveness before implementing it. 3 Comments on "Asteroid Dust Could Shield Earth from Harmful Solar Radiation"
Of course, we know that the rays that do reach the earth could still cause harmful effects like gradual evolutionary morphization. In light of that comment, it doesn’t seem like “dust” is very protective at all. Who would say we don’t react to light? For example. “gradual evolutionary morphization” What is that supposed to mean? Morphization is not even a word. This apparently is an example of the continued evolution of language,in this case English,to allow the conveyance of meaning by synthesizing a word which,by its structure,can be deciphered as to its meaning by using familiarity with the components which comprise it.To wit:the base morph,indicating “to change”,and the ending “zation”,indicating a process.Admittedly,it may not be accepted usage,but like slang,manages to be meaningful.